As usual, Android Authority has come up with its Sunday Giveaway in which they gives One Smartphone to Lucky Winner each Week. So this Time, Android Authority is Giving Away Free ZTE Axon M Smartphone. The ZTE Axon M is different from other Smartphone and has two 5.2-inch screens for double the productivity & Entertainment. Using these two screens, you’ll be able to run two application side by side, or use both screens together as a whole canvas. 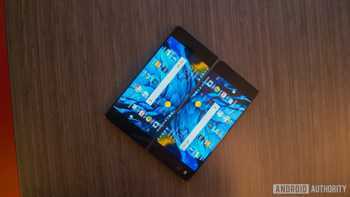 It’s the First Foldable Smartphone. To Win this Amazing Smartphone, You have to follow the Procedure given below. A Big Congratulations to Last Week 3 winners of Best of Android 2017 Giveaway – Stijn C. from Belgium, Alexander C. from USA, and Vlad I. from Canada. Camera: 20 MP sensor with an f/1.8 aperture that can be used as both the front and back cameras. To enter this Giveaway, First of All Goto ZTE Axon M giveaway Post. Now Login using Email or Social Media Account. Now Follow up the Actions showing on Giveaway Widget to get Entries for giveaway. Increase your Chance to win this Superb Smartphone by collecting maximum possible Entries. Winner will be declared once giveaway ends.